Dolgellau: Accommodation, Attractions, Activities, Going Out, Shopping, Things to Do, Places of Interest, Outdoors, Llanberis Holidays, Llanberis Area Location, North Wales. Dolgellau is a Welsh mountain town built on the wool trade. 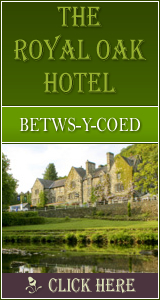 It is the gateway to South Snowdonia and a town steeped in folklore and shaped by history. Dolgellau is surrounded by spectacular scenery and is a great base to explore Snowdonia National Park and the Cambrian Mountains. The landscape is well known for its wild but beautiful countryside and places of historical interest. It is a very popular tourist destination for visitors who enjoy hiking, horse riding, white-water rafting and climbing. Dolgellau is the main climber�s base of Cadair Idrs. Historical attractions in the town include the 12th century Cymer Abbey which is just a short walk away. The tourist information centre has a Quakers exhibition and there is also a Quaker graveyard in the town. Dolgellau has been hosting the Sesiwn Fawr (welsh for: Big Session) annual world music festival since 1992. It was originally held in the centre of town but over the years it has grown and become increasingly popular so it is now too big for the town and is now held on the outskirts of town. It has seen an array of big acts over the years including Bob Geldof, Genod droog, Cerys Matthews, Iwcs a Doyle, Meic Stevens, Super Furry Animals and Goldie Looking Chain. The festival attracts crowds of up to 5000 every year and claims to be one of Europe�s biggest and best world music festivals.